I was lucky enough to attend Demand Gen Report’s annual event, Content2Conversion in sunny Scottsdale with my team this week. You may have heard that the northeast have been getting pummeled with blizzards over the past four weeks. Snowfall totals in Boston are reaching historical marks and wind chills are reaching well below zero. Needless to say, I was quite content to get out of town and soak up some modern marketing knowledge (and sun) in Arizona. Now that I am back home, I’ve had some time to sift through my notes. Here are my highlights from the event. In the Messaging: B2B Content’s Missing Link keynote, Erin Provey of SiriusDecisions educated us on the importance of messaging in content marketing. Erin explained that many content marketers start backwards when planning their strategies. Instead of fixating on creating an ebook to release on Slideshare, content marketers should first start with understanding the proof and intent of their audience. By understanding those two drivers, marketers should be able to develop a better story. Erin walked the group throughSiriusDecisions’ Messaging Nautilus at an epic speed. When done correctly, the right message should be what is fueling your content efforts. In How to Create a Competitive Advantage by Crowdsourcing Marketing Content with Influencers, Lee Oddenshared best practices for building an influencer marketing program. So many companies are striving to become thought leaders and utilizing influencers is a solid way to do just that. Lee shared some research indicating a 38 percent lift in purchase intent when expert content is used over branded content. Plan first, ask second. It’s important to identify the goals before you reach out to your influencers. Lee recommended coming up with an aspirational theme that you can use time and time again to serialize the content and get people excited for what is to come next.Move beyond one-night stands with influencers and think about building life long relationships. What content can you help your influencers create? How can you make them more influential?Your customers and prospects are influencers too. Think about co-creating content with the audience you want to do business with. In Optimizing Every Stage of the Buying Cycle with Predictive Scoring, our own Elle Woulfe dissected how predictive can be used throughout all stages of the funnel. To help simplify the buzz of predictive scoring, Elle shared an analogy about apples. Imagine if someone gave you a basket and asked you to fill it with apples without telling you where the orchard was. You may get lucky by wandering around the woods, but it would be hit or miss for the most part. Now imagine if someone gave you the basket and a map indicating where all of the apples were. That is how predictive analytics works. It is telling you where to focus and harvest the segments of your leads, accounts and databases that are most ready to buy. Predictive scoring factors in all the available data about customers and prospects, including fit, behavior and intent data coming from marketing automation, CRM, social media, the Web and beyond. Just like how apples are an ingredient in many foods and drinks, a predictive score is an ingredient that can be used to shape your marketing efforts throughout the funnel. Predictive scoring can be used to for more than just prioritizing your leads. In fact, Elle shared how we are using our technology to fill our funnel. Since predictive marketing is a new market, we don’t suffer from the curse of lead abundance. 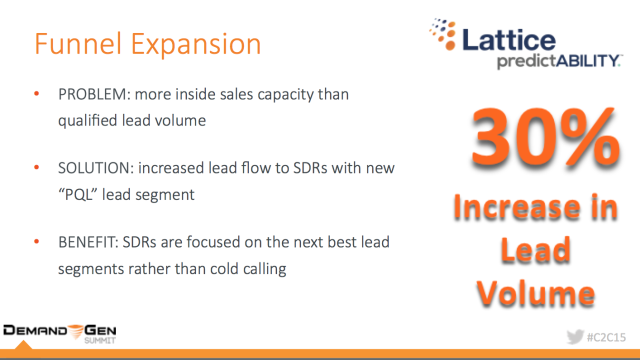 We actually have a greater inside sales capacity than our current lead volume. We use predictive lead scoring internally to identify our next best lead segments.